One of the most striking results to emerge from this MobileTrends report is the natural synergy that exists between social media and mobile broadband. This is clearly illustrated by the rise in Twitter and Facebook. This synergy continues to strengthen as social networking becomes a ‘must-have’ part of our lifestyles and changes the way we conduct both our personal and business lives. For those who think Facebook shouldn’t do a phone, I have to disagree, especially after seeing these results. 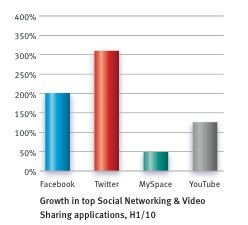 The previous Allot survey, which measured traffic during the second half of 2009, showcased the rocket-like growth of YouTube (s GOOG) and HTTP streaming via mobile devices, prompting me to write that YouTube will kill fat rate broadband pricing. Well, that’s happening, as AT&T (s T) has already rolled out tiered pricing (with lower tiers!) and Verizon (s vz) contemplates its moves. However, Verizon’s consideration of a different plan from AT&T, (its CEO Ivan Seidenberg had said he didn’t agree with how AT&T “valued the data”) has me wondering if Big Red might come out with something truly innovative, splitting out different types of traffic for different speeds or quality of service guarantees. Net Neutrality advocates would throw a fit, but just last week, my colleague Ryan Lawler reported that YouTube is building a specialized mobile site and looking for carrier partners to create plans over which such traffic could be delivered. If the carriers want to take a look at segmenting their plans via the type of traffic delivered, Allot would love to help them, as that’s what the company’s software does, but the idea of such segmented pricing also offers carriers a way out of declining average revenue per user for voice, and the inability to recoup that decline with mobile broadband price hikes. As for voice ARPU, the Allot data indicates it’s likely to continue declining, not only as networks go all-IP and voice becomes just another bit in the stream thanks to VoIP, but also because more and more conversations are taking place via Skype and on other mobile IM apps. 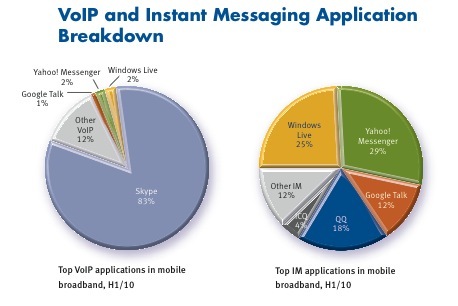 Skype takes the lion’s share of these IM and VoIP traffic streams, but all in all, the voice via IP and IM has risen 84 percent, during the first half of the year compared to the same time frame last year (it is still less than 5 percent of overall traffic though). 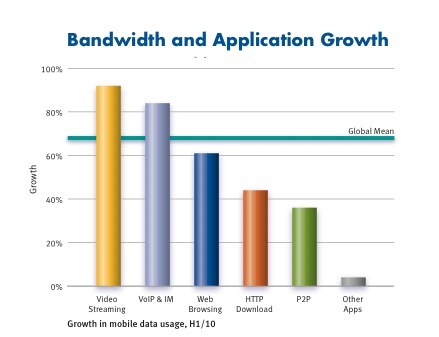 Using the Allot data, I can envision folks electing different mobile broadband packages based on their desire to consume video, update their Facebook pages and send photos, as well as use productivity and collaboration applications like IM or voice. It’s not just a potential opportunity to boost margins and eliminate the heavy loads on the network, but it’s also a chance for handset makers to differentiate their devices, either with unique built-in user interfaces or different hardware. Not that the do-everything-pretty-well type of smartphones would go by the wayside, but it’s possible that on the lower-end, such application-specific phones and plans would not only gain users, but also dominate the market. You can see this trend coming with specialty style handsets like the existing Skype or Twitter phones and the upcoming Facebook phone. There’s also the tacit admission from MetroPCS (s pcs) last week, when it launched the nation’s first LTE network with a non-smartphone, that the draw for many consumers isn’t a computer, but rather a phone that can access video and social networking sites. So consumers will get the data they want, but maybe not at the flat rate prices they’re used to, while carriers can get the margins they want while also protecting their networks from traffic overloads. The big web players can rest assured that with good execution and perhaps a carrier partnership, they can offer an extension of their web brand to the fragmented and expensive mobile web that I think we’re going to have to deal with for years to come. But where did you goooo, Stacey? I miss your posts. I’m in Stacey withdrawal. Please come back or tell us where you went. You DO realize… the whole POINT of things like data cap-based packages is to help people choose a plan tailored to their unique requirements (Facebook, IM, VoIP, etc). Also, your idea effectively would represent a dream come true for the media cartels: a channel-based internet over which they have ALL control of all content, and can force THEIR version of the web upon customers… that is simply NOT what the core idea of the internet is. I hope VZW is smarter than that. That type of traffic “sorting” is not only confusing but also holds a possibility of “creative maths” on the carrier side. Some carriers tried it over here, and unless it’s a Peek or a specific site/service that comes for free, basically no one likes the idea. I predict a lot of pissed customers and a general wave of b#tthurt if they move on with the idea.